ItemI-52570 - "A two-mile stretch of the Vedder diversion canal at Sumas, BC". ItemI-52571 - "Brentwood steam auxiliary plant, Vancouver Island Power Company Limited". ItemI-52572 - "Interior view of powerhouse, the Granby Consolidated Mining, Smetling and Power Co. at Anyox, BC." ItemI-52573 - "Stave Lake, Blind Slough Dam under construction, Western Power Co. of Canada, Limited". ItemI-52574 - "La Joie Falls, Bridge River Power Company". ItemI-52575 - "Interior of No. 1 powerhouse, Premier Gold Mine at Stewart, BC." ItemI-52104 - "Upstream face of dam showing gate for lowering into construction flume opening"; Ruskin Development; photograph no. R.P. 378. ItemI-52576 - "Interior view of Barriere powerhouse, City of Kamloops". 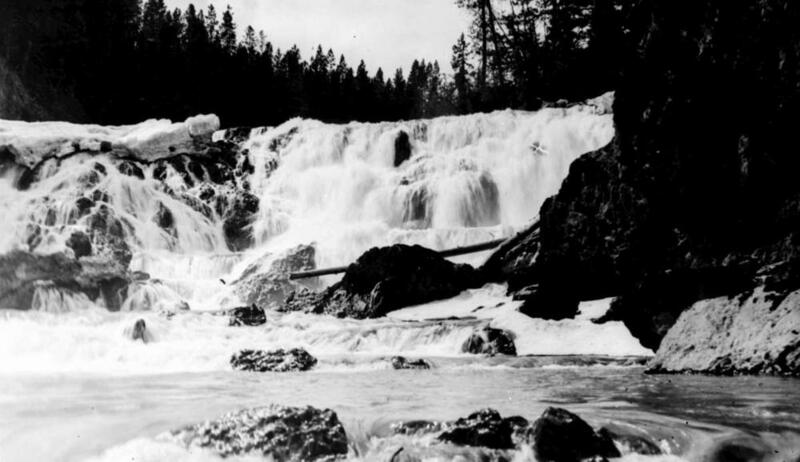 Item I-52574 - "La Joie Falls, Bridge River Power Company".